…who would have guessed that Hollywood would be out and television in? Things are changing in the entertainment industry. As movies become increasingly expensive to produce, economic common sense equals risk aversion. Stories told with the broadest strokes of the brush are more likely to garner mass appeal and recuperate costs. Playing safe when it comes to script, subject matter, choice of actors, visual ideas and trust in the intelligence of your audience is in many ways a rational adaptation to the current situation. However, financial gain sometimes comes with a creative price. It´s interesting to speculate on how many of your all time favourite movies would have gotten the ok if they would have been pitched today. It´s becoming more and more obvious that if fresh, creative and inventive is what you´re after, television is where to look. If we go way back, a phenomenon like “Twin Peaks” could be seen as an anomaly when it comes to story, while still being instantly recognizable in its format. A combination that fast-forwarded the traditional TV-drama into the future. This feeling of excitement continued years later as HBO launched series after series of high quality material, taking the type of well scripted and intelligent stories that´s usually reserved for the art-house clientele to the mass market. Shows like “The Sopranos”, “The Wire” and “Deadwood” were milestones in their own right, and seriously upped the ante for everyone trying to produce television programming. With the high output of new series we´re seeing presently, quality will of course vary and the really good ones risk drowning in the static. As I´ve mentioned in this blog earlier, the net-based streaming service Netflix has turned into a serious contender when it comes to bold and original new material. 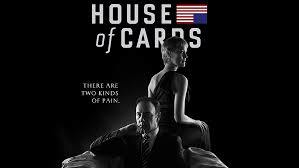 Season 2 of its unanimously hailed series “House of cards” was recently released. Such was the cravings for more of the Machiavellan machinations of aspiring president-to-be Frank Underwood, that me and the wife watched all the 13 episodes during the first post-release weekend. Clever, captivating and strangely perverse in its unabashed amorality. Can´t remember when I last saw something like this on television, or in the movies for that matter. 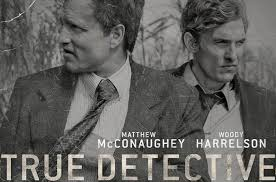 Much talked about new series from HBO ,“True Detective”, didn´t look that interesting when it appeared in the program listings. Beginning as a police procedural dealing with one of the most overexposed creatures in crime story lore, the ritually bizarre serial killer, it seemed set to rehash old genre clichés for the umpteenth time. Luckily, first impressions can be so wrong. Instead it turns out to be a dark and bumpy journey into the minds of the two detectives investigating a murder case, that´s quickly turning into just a back-drop for something else. Woody Harrelson as Marty Hart plays a character that he´s done many times before, and his philandering, hard drinking, regular guy serves as a point of normality of sorts, contrasting Matthew McConaughey´s deeply troubled Rustin Cohle. Cohle is a fascinating character, fiercly intelligent but with a decidedly bleak philosophy of life coloured by the loss of his family. McConaughey, whom I´ve previously regarded as a fairly light-weight pretty boy doing rom-coms, plays him brilliantly. As the underlying murder plot slowly gains traction and draws you in, the interaction between the two main characters and their respective stories still remains the real focus and is what keeps you watching. I promise, you´ve never heard dialogue like this in a television show, ever. As of now, only two episodes left to air and I can´t wait for the next one. This entry was posted in Movies and TV-series and tagged HBO, House of cards, Kevin Spacey, Matthew McConaughey, Netflix, True Detective, Woody Harrelson on March 2, 2014 by danolofohman.